I'm not quite sure what I was expecting at Blakemere Village but as it's only a 20 minute drive away from our new home and we needed to get out for a few hours, I thought it was worth a visit. We arrived about 10.30am and it felt like we were the only ones there! It opens at 10am but considering it was a Saturday when we visitied, I would have thought they'd be a few more people about. We had a wander around the whole village first, seeing what there was. We found the 'Adventure Play Area' but I think this is a bit of an oversell as it's just a few climbing frames. As it was so damp we unfortunately couldn't use it. This area is free at least, if the weather permits use! Then we walked around the rest. We didn't go in to any of the shops on our first walk around and accessibility looked a bit hard into most of them with a pushchair. We spotted a small outdoor ice rink so I enquired about this but it didn't open until 12 o'clock. There's also a Miniature Railway behind this but I couldn't see any clear signage about this (it probably opened at 12 too!). Then we found the soft play - Barnaby's Play Barn - but they had a private party in and weren't open until 12. We weren't doing very well! I decided to treat us to a hot chocolate whilst I decided what we should do next. I was sorely tempted to abandon and go home but could tell that this wouldn't go down too well with Little Miss A. We went to Heirs & Graces to warm up and have our hot drink. It's a sweet little tea room but not ideal if you've got small toddlers who like to run around as it also sells home interiors and giftware so there are lots of nice 'breakable' items! Luckily for me, Baby R was in his pushchair and Little Miss A acted very grown up and sat beautifully at the table whilst she had her hot choc. I killed as much time as possible in the cafe and then we popped into a couple of the toy shops. 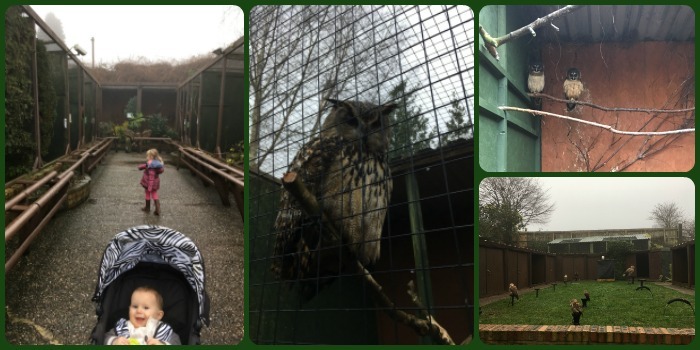 Then I saw that the Cheshire Falconry Aviary was open (success) so we had a walk around this. It was just £3 entry (as kids under 5 are free) - a result! There was lots of different species to see including a lot of owls. It's not a very big Aviary but was enough to keep Little Miss A interested as she tried to spot the birds in each enclosure. At various times they do flying displays and you can also book falconry experiences, but the basic entry for the walk through was enough for us. We were getting close to the time for the Soft Play to open so we popped back to the car for a snack and then went in. It cost us £4.25 for entry plus I ended up buying Little Miss A a drink as she was really thirsty running around. This is the weekend price for over 2s. It's £3.50 for under 2s, £2 for 9-11 months and free for under 9 months, so luckily for us Baby R was free this time. This was his first experience of soft play and he liked the ball pit the best! It gave Little Miss A the chance to burn off a lot of steam anyway and cheered her up no end. There are a whole host of other activities available at Blakemere aimed at older children including archery, a low ropes course, crazy golf and segways. So you could easily fill a day here but costs would mount up. The good thing is that car parking is free so you can be there as long as you need. Maybe there is a lot more atmosphere when everything is open and the weather is better, so we may revisit again in the future, in particular to use the soft play barn. I hate when we arrive somewhere before it opens, luckily these days my two are almost 11 and 12 so they're happy to spend some time in a cafe if a snack is involved and there is phone signal. It is hard to keep them entertained until things open. Thank goodness that she's now old enough to sit in a cafe and enjoy a hot choc!